I wanted to give us a break from the all-website-all-the-time posts I’ve had here lately, but then an idea hit me that was too good to ignore. More accurately, Linda Adams left a comment on my post from two weeks ago that struck me as something we don’t talk about enough: accommodating disabled readers in an online world. The internet—email, blogs, YouTube, Instagram, Twitter, you-name-it—exists on a primarily visual medium. And computer monitors can’t fabricate braille. Yet vision-impaired readers—and writers—want to participate online just as much as we all do. A member of my local writing group is blind, and she’s in our Yahoo group and I’ve exchanged email messages with her. Her disability shouldn’t hold her back from being an active member of the writing community. Linda’s comment helped me recognize that we can make vision-impaired readers and writers welcome at our online homes with just a few minor tweaks to our sites and our behavior. So I asked her to share her tips. In this post, we’re focusing primarily on those with vision difficulties (something that many of us might encounter eventually with all the time we spend on our computers *smile*), but some of these tips will help readers with other disabilities as well. Please welcome Linda Adams! I went to four science fiction conventions last year. There are a lot of disabled fans attending—blind, in wheelchairs, with breathing equipment. And that doesn’t include the disabilities that we can’t see, like a person who is hearing-impaired. Web designers often don’t build with accessibility because it does take longer, and there are some cool design elements that are not going to play well with it. Besides, they don’t have any problems seeing the site, so why bother? Then I think of my father, who was invited to visit a website—only to discover that he couldn’t read the content because of color choices. All of the tips below are common sense to make a site accessible, and you don’t need to know anything about web design to do them. Fonts: Make sure your fonts are a readable size. If it’s too small, it will create problems for people will low vision. But font size also presents a challenge for anyone over forty who uses reading glasses. Think about that a moment. Not everyone has low vision. But everyone hits forty and eventually needs reading glasses. See what the world looks like for people with low vision. Color: Make sure your color contrasts so it can be read. This seems obvious, but I’ve run into a site with a white background and yellow text. Even someone with perfect vision will have trouble reading that. Also avoid requiring the color to be an essential part of understanding what the content is. Colorblind people won’t be able to tell the difference, and people with low vision may also have difficulties. See how colorblind people view the world. Photos: We all like to put photos in our blog posts because they add to our writing. But to a person who can’t see, that message gets lost. Take a few minutes when you upload your photo to add a description of what a photo looks like into the Alt Text field. The Alt Text field tells a screen reading device what’s in the photo. While you’re at it, add a caption in the post. This helps people with low vision who aren’t using a screen reader and can be used as a fun tool to enhance your blog for all readers. Check out how images can cause problems for people who can’t see them. Captchas: Captchas are an attempt to stop spammers, but to combat improving technology, they’ve become increasing difficult to read. I often have to make four attempts to post a comment on a blog, and sometimes I give up in frustration. So imagine what it’s like for the visually disabled who have the rely on poor audio to tell them what’s in those captchas. If you’re getting so much spam that you need captchas, maybe it’s a good idea to start looking for a different blogging host. If anyone has had problems with accessing websites—disabilities or not, please tell us your stories! 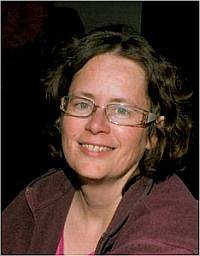 Linda Adams is a travel administrator by day and an action-adventure writer by night. She has a short story published in the anthology A Princess, A Boatman, and A Lizard and is working on a contemporary fantasy/action-adventure novel. She is also a former soldier and served during the first Persian Gulf War, when it was still strange and new for women to be at war. You can visit her blog “Soldier, Storyteller” at http://garridon.wordpress.com/. Many tips focus on our links. Are they underlined and another color to make them clear they’re a link? Do they have descriptive words or a vague “click here”? Do they rely on color, “click the red button”? If we use videos or audio podcasts, do we include a summary or transcript? My audio processing is terrible, so summaries and transcripts appeal to those like me as well. And we’ve all shuddered through those sites with red text on a black background. Guess what that red looks like to people with some forms of colorblindness? More black. In other words, designing our sites to be disabled-friendly is often related to being reader friendly in general. *smile* Thanks again to Linda for bringing up this subject! Do you or others you know have disabilities that make internet activities difficult? What adaptations have helped? Do you have other tips to share? Have you already incorporated some of these tips into your site? Do you have questions about how to implement any of these tips? And Linda wants to know if you’ve encountered problems with accessing websites—disabilities or not? What Should an Author Website Include? When Should We Upgrade to a Paid Site? ‘Tis the Season to Be Chaotic, Is Reblogging the Answer? I think it’s fantastic that you posted about this. I hate to admit it, but never, ever have I thought about our disabled readers. That sounds horrible now that I’m typing it out. Leave it to you to not only remind us (in a very non-preachy way) that there is a broad spectrum of people out there wanting to experience our writing, but you’ve also given us the tools to make our websites more accesible to them. And, honestly, all of the tips you provided are simple fixes that can make a big impact on those struggling to see. Thanks so much for your wisdom. No, you’re not ignorant. 🙂 Honestly, I’d thought of it only so far as the tips I’d heard of before, so I’ve been doing ALT tags on most of my images all along. But that’s exactly why I wanted to do this post. It’s not that we want to be exclusionary. It’s just that we honestly don’t know. Probably many web designers don’t even think or know about this issue, and we’re writers, not designers. However, I know for myself that I’d make any accommodations I could–especially when many of them are easy and good design practices anyway. So this post isn’t about shaming us but about spreading the word so we’re all aware. 🙂 Thanks for the comment! I think I probably wouldn’t have thought twice about it if it weren’t for my father’s colorblindness. He has trouble with ordinary everyday things because color is often the only frame of reference. He went to Wisconsin last year and had trouble with the stop lights because there, the lights are horizontal, so the location of the light didn’t help him. I try to think about these things, but I’m just nearsighted, not blind or colorblind, so I don’t always do so. I do try to make use of “alt” tags and such, but when the picture really doesn’t matter, I tend to omit it. Ooo, there are colorblindness filters for checking our sites? Do you have a specific online tool you recommend? Thanks for the idea and the comment! I use this one, which is rather slow, but it works. If I rewrite my site from scratch, I might see about building a filter script. I saw that one in a quick Google search, but as you said, it’s slow, so I was wondering if you had other suggestions. 🙂 Thanks for sharing the link! When I first did websites, they didn’t have a lot of the tools they have now. It was actually pretty primitive. All it told me was where alt tags were missing, and I had to eyeball everything else! Technology has helped make things a lot easier (and complicated it as well!). Wow. What a wonderful article! I’m not disabled, but I do wear bifocals. My vision has deteriorated markedly over the last few years due to the amount of time I spend reading and critting. Small font and light text on dark backgrounds give me fits. Thanks for posting this! Yes, I now draft at 124% zoom on MS Word. I need to make those letters bigger. LOL! Thanks for the comment! I’ve had to get a magnifying glass to read the label on my over the counter headache medicine. Even with reading glasses, I have trouble reading a font that must be a 3! And I remember my grandmother frustrated with crossword puzzles because all the ones she could read were easy ones, not the hard ones she wanted to do. I just looked up the screen reader demos and/or free versions: Jaws, Window-Eyes, System Access (click “Begin” to download), and NVDA. I hope that helps us all! Melinda, unfortunately, search engine optimization sites have said to use headings and alt tags for keywords. That’s probably caused the overuse of them. I’ll have to start adding more headings myself! What a great post. As a matue reader who uses readers *ahem* I really appreciate what Linda has to say here. And what a good point about making sure our fonts are big enough. Is there a preferred size? I still have everything on ZOOM x 200 jazillion! I also appreciate your point about making sure we are not neglecting the needs of an entire population. As you said, these slights may not be intentional BUT the decisions we make could help or hurt book sales! That’s a great question about a preferred font size. Maybe some of the articles Linda linked to would have that information, but I don’t know off-hand. Thanks for the comment! Renee, I know for me, I tend to need proportionally spaced fonts. I tend to loose i’s in the middle of the words with the ones like Arial and Veranda. The i’s disappear, especially next to taller letters like l’s. I often find after I’ve visited a message board that I’ve left an “i” out of a word. One of the first things I did when I set up my blog and published my first post was squint at the font. The template I’d chosen was exactly what I wanted my blog to look like, except for the font. I got the custom upgrade that allowed me to change the font to a more readable one and increase the size a couple of points. Best $30 I ever spent! Speaking of which … There’s a lovely lavender-ish colour behind your replies to comments but our comments simply scroll against the static background image. Is it possible to have a block of colour behind them as well? As for the color behind the replies, my site has coding to make the post owner’s replies show up with color, and I’m not sure if something similar could be done for the others. I’ve struggled with the readability issue of my background. It was a great day when I figured out how to code the gray background behind the post itself. 😀 Thanks for the comment! *shrug* It’s the first thing I’d try, and if you don’t want it white, you can always adjust the color, if it works. P.S. The problem is that might change the background color on your comments, too, but if it does, there are a few possible ways to fix that. Yes, that’s what I’m afraid of. And honestly, I don’t know if it’s a big enough deal for me to struggle with code for hours to make them all get along. 🙂 Thanks for the information though! Yep, it’s always a matter of getting the code to play nicely with each other. 🙂 Thanks for the information! You always have incredibly interesting posts. This has been very informative, thank you! Nope, not a dolt. LOL! It’s just something that those of us who don’t live with these challenges think about. I’m happy to help spread the word about how we can reach more readers. 🙂 Thanks for the comment! I think it’s hard to imagine unless you’ve either experienced it or know someone who’s experienced it. I have flat feet and I’m a horrible runner. When I was in the army, I had problems with the naturally gifted athletes. Their perception was that it was easy, and they always thought I just needed to try harder. Sometimes I wished they could live in my body for a day, and then they’d stop complaining at me. 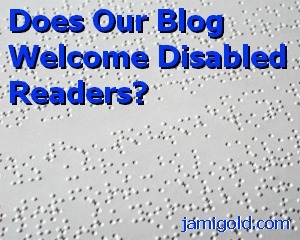 I am embarassed to admit this, but I’ve never thought about making my site more welcoming disabled readers. Seriously, I am so oblivous sometimes. I will keep these tips in mind when I change up my blog and website this spring. Thanks for the tips, Linda! Don’t worry, I’m Queen Oblivious sometimes–hence my broken toe. 🙂 I figured many of us hadn’t thought about this issue before, which is why I thought this topic was so important. Thanks for the comment! I think some of it is a matter of exposure. When I was growing up in California, I only saw two people who were disabled, and one was very elderly, so I didn’t think much about it. But Washington, DC has the largest employer of the disabled: The Federal Government. It’s not hard for me to go a day without seeing someone disabled because everyone has to go to work! This is fabulous information! Thank you. I am not disabled, but even I have some of these issues with certain blogs–with my eyes being above age 40. The captchas are killers for me because I sometimes have to enter the information three times before I can read it and get it right. I have to be pretty motivated to leave a comment, or I’m gone. Also, I have a writer friend whose blog I would love to read, but her dark background and low-contrast text is so frustrating to my eyes that I no longer go there. It’s sad; she has good content, but she lost me as a reader because the words were hard to read. Oh yes, a good 80% of the time I have to guess at the Captchas. Grr. As for the dark background issue, I don’t mind reading a single page of it, but I’m less likely to click around and explore more content. Thanks for the comment! Julie, I’ve run into sites where the contrast was so low, I had to highlight the text to bring it up. I can’t imagine why someone would chose such a hard to read format. Then, of course, I also ran into a magazine website with mystery navigation. I was greeted with a green textured background and nothing else. On a hunch, I moved my mouse around until a link popped up. I think the people with screen readers would have been at advantage — the reader would have found the link! I emailed the webmaster he might want to fix that because it was going to keep people away, and his response suggested that he was just going to leave it that way. Needless to say, I decided it was not a good idea to submit to them. Ugh. Yes, I’ve had to do that too. Awful design.